So I challenge you to race with the RobZFitness team members to the top of the Bank of America building Saturday, March 10, 2018 at 8:00am. I promise you will have a lot of fun and probably get in one of your best workouts of the year while supporting a great cause. 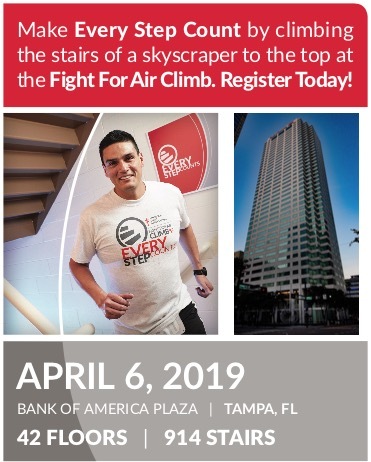 I have joined the American Lung Association’s FIGHT FOR AIR STAIR CLIMB / Tampa. Here is the RobZFitness Team Page to register. This vertical race challenge is professionally timed and ranked 42-floor story climb. I would be honored if you would join my team. If you can’t climb with me, please consider making a tax deductible contribution. Any amount you decide to give will help me reach our fundraising goal. All proceeds go to the American Lung Association in their mission to save lives by improving lung health and preventing lung disease. Let’s make this year the best climb ever! Please contact me at (813) 571-3700, email me at Rob@RobZFitness.com or visit my team page to sign up or if you have any questions about this years climb.